MUCKRAKERS have a long and proud tradition stretching back to Progressive era in the late 19th century United States. The term (from the Man with Muckrake in John Bunyan's The Pilgrim's Progress) was coined to describe those investigative journos exposing social ills and terrible conditions such as in slums and prisons, sweatshops, along with issues like child labour and food processing cheats. Some also exposed fraud and abuse in politics and corporations. Bethany McLean's Enron expose was a classic example in contemporary times. And now the Fiji Sun is idolising itself for the muckraking feat of their absentee award winners - publisher Russell Hunter and investigative writer Victor Lal. Hunter, booted out by the Fiji military-backed regime in late February, and UK-based Lal, were honoured at the annual FAME media awards in Suva at the weekend over the inquiry into Mahendra Chaudhry's controversial offshore accounts and tax issues. The judges said: "Mr Hunter’s leadership and support for Mr Lal and the Sun’s editorial team provided the professional context for what is arguably the best example of investigative journalism in the history of the Fiji media." No doubt this was an excellent piece of investigative journalism worthy of an award. (And The Fiji Times also deserved recognition its own parallel investigation and naming the then accused minister - leading to publisher Evan Hannah also being deported.) But to devote the entire front page to a back-slapping effort is over the top coverage for any newspaper. News or merely PR hype? And there is another dimension to this saga, as former Fiji Daily Post publisher Ranjit Singh rightly points out, in that the Fiji media never pursued the corrupt practices of the Qarase government with the same zeal reserved for Chaudhry. Cafe Pacific would also take issue with "arguably the best example of investigative journalism" in Fiji claim. The article pieced together the maze of relevant facts, unearthed new information, and interviewed major players in the matter, to provide the reader with a compelling account of corruption and incompetence within a country's major financial institution. The journalist used a range of investigative techniques from relentless pursuit of a wide range of sources, to researching companies and individuals associated with the bank. The story added to the public understanding of a major political and business crisis in Fiji society. 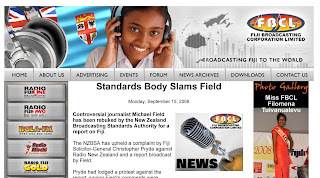 This was the first and best example of investigative journalism in Fiji. The Review obtained and published the ‘confidential’ Aidney-Dickson report on the National Bank of Fiji. Through the publication of the report, the nation came to know that their national bank was technically bankrupt. The Review published an exhaustive, 14-page account. It also publicised the full list of debtors and amounts owed. Businessmen, politicians and relatives and clients of the bank’s employees had been fleecing the institution unnoticed. The names of companies and individuals read like a "who's who" list in Fiji and created a huge furore. The subsequent loss of Rabuka’s SVT government in the 1999 election was partly due to the scandal. Losses eventually amounted to more than $350 million. The economy has never quite recovered. A disappointing aspect about the media's performance in reporting the FAME awards is that while they are self-congratulatory about their own successes, they're reluctant to give credit where credit is due to their rivals. Not one newspaper (or radio station or website) has given a satisfactory overview of the awards. The Fiji Media Council ought to step in and run a "neutral" news report on its website to be fair to everyone. (Only the 2007 winners were listed on their website when checked today). 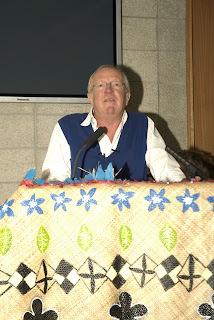 IT'S remarkable how a non-story refuted by a couple of throwaway lines by British foreign correspondent Robert Fisk over a non-meeting with accused members of the so-called Tuhoe 16 became a beat-up in two media outlets at the expense of hard news this week. In an hour-long AUT University dialogue (mostly monologue - but riveting, inspiring and entertaining), Fisk only spent 31 seconds on the topic - and this was in response to a question from a student about a posting on David Cohen's notorious (non)blog at the National Business Review claiming he was going to meet Tame Iti and others at Te Tirahou marae. Fisk dismissed it out of hand, saying nobody had discussed it with him. He said he had no time to be involved in local stories: "I'm 62, have 22 countries and four wars to cover, I don’t have time for anything that does not involve the Middle East". While he did talk to Ahmed Zaoui when in NZ three years ago, it was "clearly an Algerian story". The beat-ups (following the original mischievous Cohen beat-up) were in Scoop, who was asking for the "real leak" to stand up (not a bad idea, but it won't happen), and NZ Herald Online. Fisk launched into an attack on the internet, saying the medium was out of control and lacked the integrity of the printed paper. As far as he is concerned, the internet is a "system of hate" and fuels the risk of an extreme act by a nutter against outspoken journalists such as him. Here's a story that came out of the seminar that does have some substance - the transformation of the US Soldier's Creed to the Warrior's Ethos ... war without end! Of course, little was reported about that. This video clip is thanks to the Pacific Media Centre team of Kate Morse, Joe Rixon, Naveena Baratharaj and Jim Marbrook on the PMC YouTube channel - and there are a couple of other good ones '50/50 journalism' and 'weapons of mass destruction'. 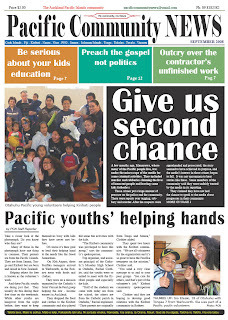 ALL power to Warkworth's Tabs Korauaba and his Tuvaluan partner, who have launched a new pan-Pacific paper this week. Café Pacific hopes the monthly Pacific Community News succeeds where other ventures have failed. Tabs, originally a broadcast journalist from Kiribati, got his print creds the hard way - by publishing Tematairiki and Rodney Today. Both went under. The reason? No team, no mission, no funding, he admits. But Tabs reckons he has now absorbed the tough lessons from the two previous publications. Third time lucky? Some pan-Pacific papers have been launched before and they went under. I think the problem was that they didn't have enough planning, didn't have a committed team, were impatient and, of course, they didn't have enough advertising. But that's in the past. This is today. I always remind myself that being a publisher means not dwelling on the past so that it doesn't control the future. We talked with some businesses and they liked our positive vision so they came on board. And after six months ads will really start to roll. That's her view. But I am not very keen on 'talking' - I am a doer and I always experiment on new things. But she musn't worry, because we're not going to hide bad stories about Pacific Islanders. We'll let the community talk about its own problems and its own solutions. Reporting about crimes and negative stuff are not helping at all. Successful people achieve their potential because they are positive throughout their lives. Right on, Tabs. Go for it! Malia Sio on Breaking away or breaking in? TRUE believers? A host of them trooped in for the Robert Fisk lecture/ student news exchange organised by the Pacific Media Centre at AUT University. Where were the sceptics? Apart from the core of AUT student journalists, radio and TV students and staff who had ditched their mid-semester break to come along to be challenged, inspired - and even entertained - by Fisky, there were academics, civil rights activists and many others. 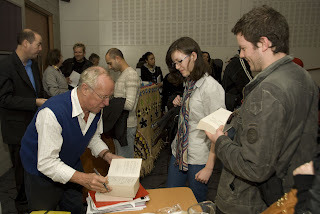 Robert Fisk was in NZ for a promotional tour for his latest book, The Age of the Warrior. The AUT booking was thanks to Amnesty International. The lecture theatre (chosen for its intimacy and which normally seats 160 people) was packed out with at least another 40 or 50 people for the hour-long lunch date. Just as well there were no health and safety hawks drifting around. Fisk was at his inspirational best - it's quite extraordinary to see a journalist having such a cult following. Many editors were sighted in the audience, including the NZ Herald's former editor-in-chief Gavin Ellis, who chose the AUT rather than his own University of Auckland bash, which was charging $25 a head for a Fisk Amnesty fundraiser. 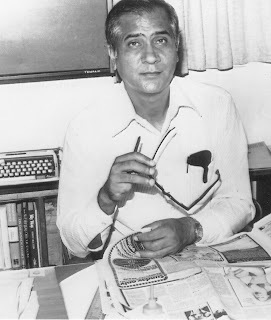 "Write only for newspapers, which print what you write as you write it". "Get on a good relationship with a trustworthy editor. If you can't find the right newspaper in New Zealand - and I can imagine what you might reply to me - look elsewhere." "Don't go into blogging, it doesn't work. It doesn't have the integrity that the printed paper has - you won't get into mainstream journalism that way, anyway." "Don't refer to the mainstream press as the mainstream press." "Don't waste your time writing for the alternative press because it is only read by believers." PMC photographer Alan Koon captured Te Waha Nui editor James Murray (top right) joining the believers at the book signing after he had seized an earlier moment to video the scribe in full force. Fiji is funny. The coup is now generating humour and the past politicians are becoming hilarious. Eighteen months after the coup of December 2006 Laisenia Qarase, the former Prime Minister was kicked out of government, his government house and his government car. He has now realised that something is wrong and become so incensed that he filed a treason complaint with the police on the grounds that the December 6 coup was illegal. Treason. 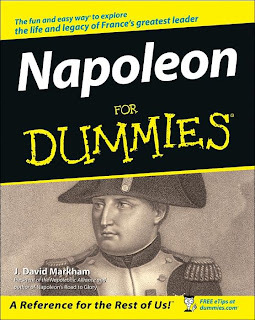 Doesn’t the word make you cringe, go pale with fear at being hanged, drawn and quartered or at least exiled for life to the island of St Helena where you will view the house where Napoleon Bonaparte contemplated his glorious past, France, freedom and failure? Qarase lodged his treason claims against a formidable group of people that include the Interim Prime Minister who led the coup, the Chief of Police who was an army officer and part of the coup. Oh, yeah, did I forget to tell you it was the coupmaster who made him Chief of Police. But there are civilians on the alleged traitors list too. It includes the aged and dignified Catholic Archbishop Petero Mataca and the 45 members of The National Council for Building a Better Fiji (NCBBF). One name on the list is John Samy, the gentle spoken boss of the NCBBF Secretariat who has led the way writing the People’s Charter with its message of love thy neighbour. Dear John also appeared on the front page of (The Fiji Sun, September 6) with his photograph and the headline "Coup was illegal: Samy". He denies saying that, but it brings a smile or scowl to the face, but which face or faces! I’m not sure who all the 45 members of the NCBBF are but they include Mahendra Chaudhry, who must have got wind of the treason charge as he resigned from the council a few weeks ago and is now defending himself with a phalanx of political jargon. There are another 44 other people on that guilty council list. They include academics, traditional chiefs, business people, trade unionists, a woman from an NGO and a priest who has spent many years helping the poor. Obviously this is a meddling priest. We all know that there only around half the nation live in poverty or damn near it. This priest says so little about the other half of the population. Now, there is prejudice for you, and as we learned from Qarase – treason! Mick Beddoes, the former leader of the Opposition, is an interesting guy. Big in body, bold in voice and so convinced that he is right. He has now publicly supported the treasonous charge brought by Qarase and company against the army and those nasty NCBBF members. But, wait, there is more. If you had watched the Fiji TV news on Monday, September 8, there was a news item saying that Mick, the man, has joined the NCBBF when it started. He attended the meeting, took the allocated allowances and then resigned. So Mick, the man must also want to be in court in the defendants’ box when the treason trial begins. Good man, that Mick is, he recognises the error of his ways, and is preparing to suffer the consequences. I don’t know if he is Catholic or Methodist or whatever, but on St Helena, I am sure the Archbishop will give Mick good Christian counselling. This Mikado story took another turn today. A former Fiji police commissioner said in a serious voice, so we would not laugh, that it would be difficult for the present police commissioner to be impartial in his investigations of the Qarase accusations, when he is also mentioned in the complaint, as being implicated in the coup. always lost for words, but who can make up for it with scowls and a few mumbled key phrases. Today he inferred that Qarase and his team are having foul fun and no good would come out it. Other men make the humour, Lewini is the straight man. We do need a reality check in Fiji, or at least in Suva, where all this stage cavorting is going on. Last Sunday on TV, the interviewer was conducting a serious discussion on proposed new rules for the next general election. He said to one of the participants who was talking about recreating part of the political past, that the boat has already left the wharf. A neat metaphor. The way I see it, the boat left the wharf during December 2006 and it’s getting further away. It’s difficult to see when it’s going to return and when it does, will it hit the wharf with a great wallop and damage both the people and the goods on board? IT wasn't so long ago that Malia Sio was lamenting on her recent blog over the apparent "demise" of Pacific journos, especially from her Aotearoa viewpoint after swapping her radio work and on the Samoa Observer plus the Tribune for a NZ j-course. She noted that only two other Pasifika students out of a programme of 25 were with her doing journalism at the revamped Whitireia course. But actually, this is better than most in NZ. (AUT has 54 media students but that's out of a programme with a total of 800 plus students. 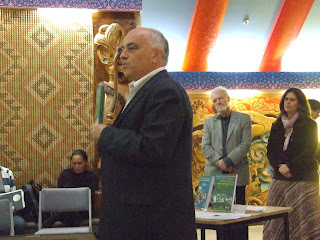 The good news though is that AUT now has a dedicated Pacific journo course on the books - the first in NZ for 17 years!) Malia has also had a crack at the lack of understanding and respect by some NZ media of the use of matai and other Pacific chiefly titles. For example, Pacific Island Affairs Minister Luamanuvao Winnie Laban would correctly be addressed as Luamanuvao throughout a news story after the first instance when the full name is given. Prominent journalist Taualeo'o Stephen Stehlin (Tagata Pasifika) is another example - but his chiefly title is rarely given the respect it deserves in the media. The price of being a journo? But in these days of muddled name styles, many papers that usually dispense with honorifics, also ditch titles - regardless of whether they're Pasifika or palagi. IT'S good to see Television New Zealand taking the Pacific region more seriously. Economic self-interest for sure - just look at the Olympic success of the Pacific Service. But there is also a sincere attempt at contributing to New Zealand's aspirations in the region as the basis of its report to the parliamentary Foreign Affairs, Defence and Trade Select Committee - in a rather more holistic way than Australia seems to manage. A pity that our newspapers don't follow the lead with better regional coverage. New Zealand was actually a television pioneer in the region. It first set up broadcasts by the fledgling Niue Broadcasting Service in 1988. And it quickly followed this pilot project with TV start-ups in the Cook Islands (1989), Nauru (1991), Fiji (1991) and Samoa (1991). The 1991 Rugby World Cup was an impetus for this. TVNZ also provided nightly feeds of Network News gratis to these broadcasters until 2005, when it lost the use of the satellite providing the transmission. Then higher costs forced TVNZ to take a good hard look at its overall model for the region. Over the past few years the Ministry of Foreign Affairs and Trade has footed the bill for seven hours of news broadcasts a week and a grab-bag selection for four hours a week - programmes like Close Up, Tagata Pasifika and Mucking In being in the mix. Immediately expanding the current service from 11 to 15 hours a week - and then to 20 hours a week further down the track. The bill? $320,000 a year. 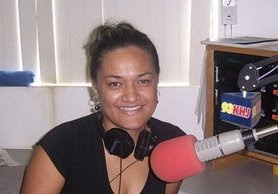 Creating a Pacific Broadcasting Trust starting in the 2008/9 financial year. About $1 million would be spent over three years to "assist broadcasters in the Pacific increase the numbers of viewers they can reach". Developing a dedicated TVNZ Pacific Channel from the 2009/10 financial year. And this would cost around $2.24 million a year. Expect this to be one of the topics for discussion at PIMA 2008. The state-owned broadcaster sees a definite payoff for the country: "An expansion of the Pacific Service would be a simple and cost-effective (as it would extract greater value out of the public funding already spent on TVNZ7) New Zealand foreign policy initiative in the region." IT'S countdown time again for the PIMA fono at AUT - this year's theme is "Pac2theFuture"! Aaron Taouma, Chris Lakatani and team are planning a big day with artists and the new media as well as a shakedown on life in the mainstream for Pasifika journos. Dawn Raid, King Kapisi and Onesian are in the frame. Great stuff. It's being planned for the AUT conference centre on October 10 with networking drinks after all the raves. More info over at PIMA's new look website and Google group. And watch for the AUT student journos on the scene, and John Pulu with BCS2 mates who are planning a video effort. Last week's Media Diversity Forum, organised by the Human Rights Commission and the Pacific Media Centre on the Nga Wai o Horotiu marae (AUT), was a success with the highlights being Tagata Pasifika's Taualeo'o Stephen Stehlin and Asia Downunder's Bharat Jamnadas. Not too many palagi mainstream media movers, but plenty of Pasifika shakers ... and a host of brown students! None of the eight tenured palagi journalism staff from AUT were there - all "too busy" to get a fresh view outside the square. If j-schools can't set the pace, then what hope is there for changes out there in mahogany row? Fiji-born Jamnadas regaled the audience with amusing anecdotes of resistance in mainstream TV because of his "accent" and experiences, but gave an insightful account of the progress of a programme that leaves TV3's Sunrise, for example, for dead. His experiences echoed those of many Pacific journalists who have migrated to NZ from the region with strong reputations but battle to even get a look in with monocultural newsrooms. (And his story was picked up as lead "highlights" item on AMIC's Alternative Media portal in Singapore. Scoop also linked to the PMC coverage). Sometimes Pacific journos eventually get a break, like Rebecca Singh as weekend news anchor of TV3. She was the best news presenter on Fiji TV, and she's now the best on TV3 too, if only they would fully recognise it. Cafe Pacific reckons she should quit NZ and team up with Al Jazeera, the best Asia-Pacific news programme broadcast in this country (but only scheduled snippets on Triangle) by far! Sometimes the Pasifika expatriates head back again, like Fiji's best political reporter, Riyaz Sayed-Kaiyum, who ended up back in Suva as Radio Fiji's CEO after a stint with Asia Downunder. But this political appointment created a loss to the journalism cutting-edge. During the forum, a couple of new Pacific media books were launched by Race Relations Commissioner Joris de Bres - Media and Development (25 Pacific contributors) and South Pacific Islands Communication (15 contributors) were "courageous" publications, he said. What a contrast with the single so-called "Diversity" chapter in the recently revised edition of the JTO journalism textbook Intro - this is so underdone it isn't much use as a teaching resource. Incidentally, congratulations to Justin Latif (Western Leader) and Melissa Davies (TV3) who won runner-up prizes in the Whitireia diversity reporting award this week - both AUT graduates and they were among the AUT graduates and current students who made up half the award shortlist, far more than any other j-school. Picture: Alan Koon. Aaron Taouma's "voices of diversity"